Southern California Infested with Brown Widows! Only days ago we reported that the base of Mount St. Helens in Washington is swarming with tent caterpillars. Insects are now climbing the list of things signaling the apocalypse might actually arrive just in time for Christmas. 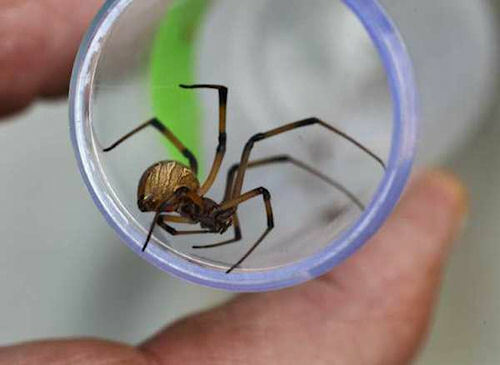 The LA Times is reporting that the brown widow spider, not to be outdone by the caterpillars in Washington, have had a recent population explosion that guarantees people living in Southern California will be dealing with the less-poisonous cousin to the black widow on a more frequent basis. Black widows generally hide in darker places like sheds, woodpiles and under porches. Usually they’re tucked away in places people instinctively don’t go. You can already guess where the next piece of information is going…the brown widow is much more extroverted than its deadlier relative. Brown widows like to relax in peoples’ things outside. Outdoor patio furniture, plastic playground equipment, under the curled lip of a potted plant, your bbq, your ‘outside shoes’ and in drought-free landscaping. Fortunately out of 72 data sites used to get a better understanding of how big this population explosion is, none of the spiders were found in peoples’ homes. Since 2003, when the brown widow first began appearing in California, the population has exploded compared to the black widows. Bright-side? 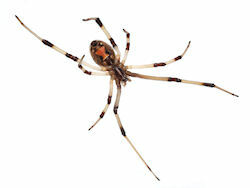 Brown widow spider bites generally hurt initially, burn for a little while and then? Really nothing happens. Carry on. Down-side? These things like to cluster. Turning over a patio chair you’re sitting in to interrupt a small party of these spiders that dwarf their darker cousins in size? 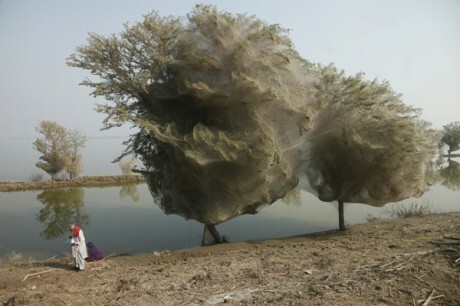 Nature’s way of going “Boo!” and making you paranoid about every nook and crannie in your immediate area. Check out these awesome 3D images of a 49 million-year-old huntsman spider that was trapped and preserved in amber. Remember the floods that devastated Pakistan last year? Well all of that flood water drove spiders into trees by the millions where they took over and created giant spider condos, which is pretty much one of the last things I ever want to walk under. I am not sure how concentrating millions of spiders into one location helps lower the population of the highly mobile mosquitoes, but that is what is being reported. Maybe it is teamwork. Although slowly killing the trees, the phenomenon is seemingly helping the local population. People in Sindh have reported fewer mosquitos than they would have expected given the amount of stagnant water in the area. 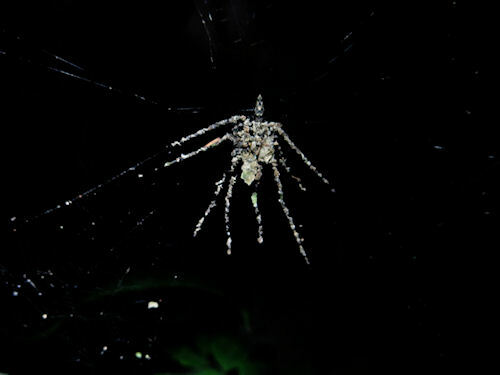 It is thought the mosquitoes are getting caught in the spiders’ webs, reducing their numbers and the associated risk of malaria. A species of assassin bug, Stenolemus bituberus, sneaks onto spiders’ webs and pretends to be prey, then captures and eats the spider when it comes to investigate. It was noted that on occasion the ploy of the assassin bug failed and it ended up being a meal for the spider regardless. A ship from South Korea was refused port when thousands of large spiders were discovered throughout the ship’s cargo. 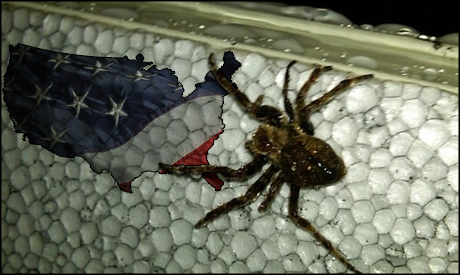 The local Department of Agriculture deemed the arachnids “too numerous to destroy or contain.” Officials are unsure of why the spiders are on board, or even what species they are. Considering the cargo was meant to build housing for U.S. military contractors it’s safe to say that “War On Ugly-Wugly Creepy Crawlies” is imminent. You are currently browsing the archives for the Spiders category.